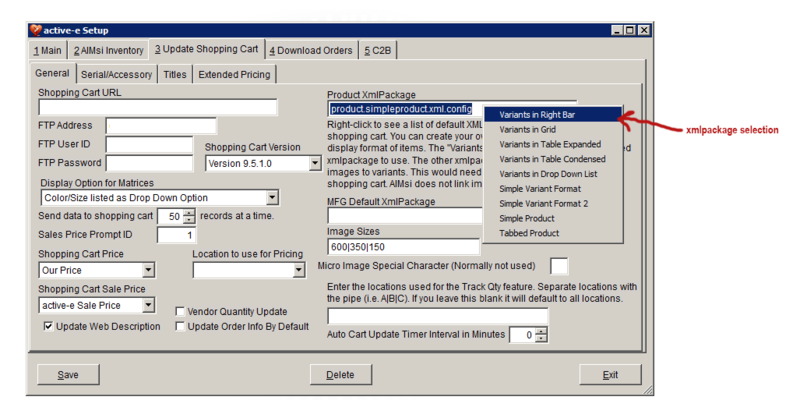 In order for your storefront entities (categories, departments, manufacturers) and products to display properly when using AIMsi, you have to ensure that the correct XML packages have been assigned. To do this, open your AIMsiStorefront setup, and go to the update shopping cart tab. Right click in the ProductXMLPackage box to see a dropdown of your XML packages, and select the one you want to use. You can see an example of this in the image below. AIMsi will periodically update your live website with new products or changes to existing products. This integration update can revert your category & product display settings if they're not set properly in your AIMsi system. If you need further support, please submit a ticket with Tri-Tech here and they can help you apply these changes.